Rory McIlroy unofficially captured the Race to Dubai as Shane Lowry imploded and American Brooks Koepka claimed his maiden European Tour win and a $1.1m payday in the Turkish Airlines Open. Germany's Marcel Siem or Spain's Sergio Garcia needed to win in Turkey and Dubai next week to have any chance of denying McIlroy his second European money title in three years. But on a day when Lowry played his first four holes in four under to briefly share the lead only to find water twice in as many holes and crash to tied 25th alongside Garcia, Siem dislocated a rib in the gym and could only finish tied eighth at the Montgomerie Maxx Royal Golf Club near Antalya. The title went to like Rookie of the Year elect Koepka, who closed with a 65 to set the target at 17 under and looked on as Ryder Cup star Ian Poulter missed a six foot birdie putt at the 18th to force a playoff. As a result, 24-year old American Koepka leapt from 46th to sixth in the Race to Dubai and from 61st to around 35th in the world having picked up the biggest cheque of his career — €930,740. Lowry won €53,636 for finishing on six under, but he was bitterly disappointed to shoot one over par for the last two rounds, adding a 73 to his Saturday 72 to miss out on yet another chance to break into the world's Top 50 and secure a Masters invitation by December 31. He also fell two spots to 17th in the Race to Dubai and outside the Top 15 who will share the $5m Bonus Pool after next week's DP World Tour Championship. 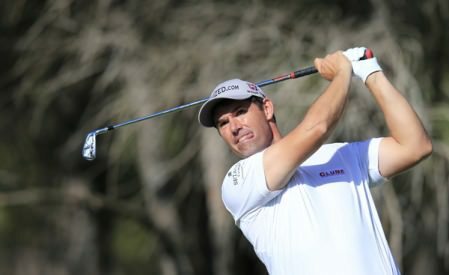 He has at least one more chance to make the world rankings leap — two if he plays in the Nedbank Challenge next month — as well as another shot at securing a minimum €100,000 payoff from the Bonus Pool. But having played the first four holes at the Montgomerie Maxx Royal in 14 under par over four rounds, he was left to wonder what might have been had he managed his game a little better on the remaining holes. He was certainly regretting some poor course management having started the weekend tied for second and then barging his way into a seven-way tie for the lead thanks to that lightning start to his final round. Just four shots off the pace and tied for eighth overnight, he birdied the first and third and then hit a 212-yard five iron over a lake to two feet at the par-five fourth and rolled in the eagle putt to share top spot on 12 under. A third European Tour win was within his grasp but whether it was anxiousness to make that move in the world rankings and secure a Masters ticket or simply a case of running out of steam in his ninth start in 11 weeks, a triple bogey six at the par-three fifth ended his title dreams almost immediately. "Five iron, exact same number as I had on 4," Lowry said disconsolately of the tee shot that leaked right into the lake. "I don’t like that shot and my long iron play is a bit suspect at the best of times." He then over-drew his tee shot at the sixth and made a double bogey six, ending his title hopes. And while he cancelled out bogeys at the par-three eighth and the par-four 17th with birdies the par-five 13th and 18th holes, he admitted that the triple bogey at the fifth was the killer blow. "It’s been a frustrating day and I played alright other than those two holes really," Lowry said of his triple-double run. "I hit it in the water on 6, got unlucky with next shot, plugged underneath the lip and could barely find the ball. I had to take a penalty drop into the bunker. "It was going to be one of those days after that. As soon as I hit it into the water on five and made triple, I stopped seeing shots. I stopped seeing lines on putts. It was difficult from there." Lowry said earlier in the week that the best way of taking his mind off things like his world ranking was to adhere to the well-worn golfing cliché of taking things one shot at a time. "It is hard to do it and I didn’t do it today," he said. "I worked pretty hard and tried my hardest. Level par was kind of the goal and I was trying to get to 10 under. "But I then made a bad mistake on 17 again, hit the ball with a bit too much draw. Even my good shots were turning over a little bit, so it is something to work on and straighten out before next Thursday." Likely to fall one spot to 52nd in the world when the rankings are updated on Monday, Lowry wondered what might have been had he played the other 14 holes as well as he played the first four. "I was 14 under for first four holes — from there I should be winning the tournament," he said with a grimace. That honour fell to Koepka, who was immediately congratulated on Twitter by Race to Dubai champion elect McIlroy. Massive congrats to my good buddy @BKoepka on the win in Turkey! Very well deserved, enjoy the celebrations! "Well, first off, he's had an unbelievable year," Koepka said of McIlroy after making a stellar par at the 18th, hitting a 228-yard five iron to the heart of the green having been forced to chip back to the fairway after a wild drive. "I think what he did this year was pretty special, and you know, we've gotten closer over the last maybe year and a half, year. He's a good friend of mine. "We played a couple practice rounds together this year and I think it's important just to play with good players in the practise rounds. I do it in the majors as much as I can, play with guys like Adam Scott, Rory, and guys like that where you can learn something. "Although we are similar in age, he's got a lot more experience than I do. And just watching him and how he handles and preps for golf tournaments has helped me. "Rory has had an unbelievable year." Poulter was furious to let victory get away and while he shot 67 in the final round, he admitted that Saturday's 75 was the killer. "I missed a couple of opportunities coming in," Poulter said. "That was the difference, a couple of putts there, 15, 17, 18. I can look back and add them up and there was plenty. Damage was Saturday. I played some good golf this week. And to play a bad round on Saturday is a bit inexcusable and that's what happened. "There's good players out here week in, week out and you need to play well for four rounds of golf. "Disappointing is the outcome. I think hats off to Brooks for a great round today. Obviously he's played some superb golf there. The damage was done on Saturday. That, for me, is really disappointing; to have played three great rounds of golf, and just one blip on Saturday, which is a real shame. "So you know, it's frustrating, is what it is. There's no other word for it. Yes, I'm going to be angry. I'll be angry for a good few days. But that's fine. I'll keep myself in my own little room and have a little chat with myself and come out and win next week." Darren Clarke's European Tour season ended with a 72 worth a share of 64th on two over par and 135th in the Race to Dubai. As for Michael Hoey, he's off to Dubai feeling better after picking up a bug before his visit to Turkey. The Belfast man goes to the DP World Tour Championship ranked 56th in the Race to Dubai having finished 75th in Turkey on 15 over after a closing 73. Not even a collision with a tree in the middle of his back nine could stop Shane Lowry’s dogged pursuit of Ian Poulter in the weather-delayed second round of the Turkish Airlines Open by the Ministry of Youth and Sports. Shane Lowry’s hopes of breaking into the world’s Top 50 suffered a reverse when he paid a high price for what he admitted was unnecessary aggression, poor course management and lack of patience in the third round of the $7m Turkish Airlines Open. Graeme McDowell shot his best round of the year and Shane Lowry “got away with” one of his worst in the Turkish Airlines Open.